Growing up in a Tamil Brahmin home, eating the likes of idly and dosai's a few times a week was standard operating procedure for us. As children we would have ghee with our idlies, and ghee mixed with sugar, or yogurt mixed with sugar for our dosai. 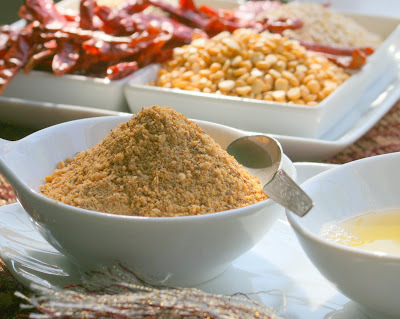 As our palates matured the condiment of choice fast became idly milagai podi, or dosai milagai podi (milagai means chili in Thamizh). 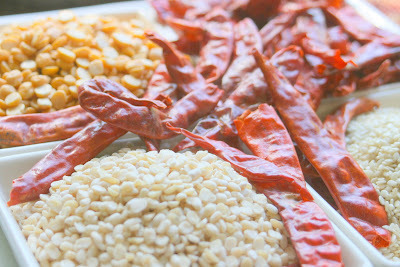 This hot dipping 'sauce' is created by roasting and grinding dried red hot chillies with a few lentils, salt, and the ever present asafetida (referred to as devils dung by some). It is then served with gingelly or sesame oil, and then mixed up on your plate right as you begin your meal. The standard meal "to go" for us is rolled up dosai's or idly's slathered with milagai podi. No matter what is available at home, even if no one has gone to the market, there will invariably be dosai with with milagaipodi 'thottuka', on the side. 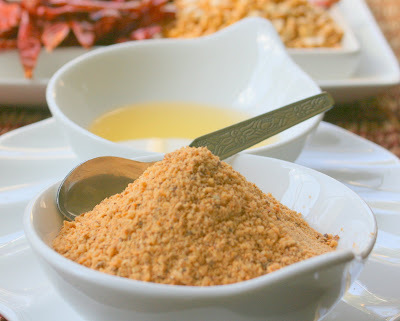 Red hot chili powder served with oil, my entry for Nandita's Jihva for Ingredients - Chillies. 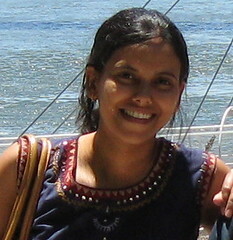 Nandita hosts a wonderful blog called The Saffron Trail. 1. Roast the chana dal, urad dal, chillies, and sesame seeds on medium low heat until they release a little of their oils and leave off a fragrant smell. 2. Grind all the ingredients together along with salt, and the asafetida. Serve this along with sesame oil. The amount of chillies be adjusted according to ones taste. This is another family recipe, and was taken from my brother-in-law Gopi's website. Great pics!! Good luck in the contest! nice recipe. kanchana, have you tried black sesame seeds? in kerala, we use this in our podi. it gives a different flavour dimension. it's stronger and smokier than the white. 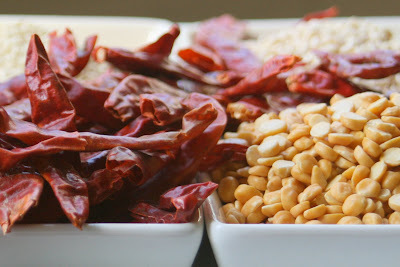 Hi Kanchana, Great recipe and pictures! I make a diferent version of this podi. I'll blog about that soon! This is exactly how my mom makes it, actually I add a tiny piece of tamarind which is also sauted in the oil for a few seconds. I just made a small batch to go with Adai and was going to post it on the blog soon :) I absolutely loooove this podi. I even have it with curd rice, upma apart from the normal dosa/idli....I just need an excuse to have some. Wonderful pics ! Lovely pictures. I love the look your website now. The white brings out the essence of your pics! Gorgeous pictures, Kanchana! 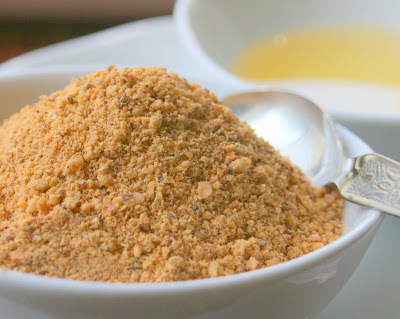 I only started making this podi a few months ago, and I am just addicted to the stuff. Growing up I have had this with fluffy idlies from my Tamil classmates' tiffins! Now I make my own, and it is served always there for the idly-dosa-adai meals! I'm almost out of it and will give your version a try this time - the bright red 'gun-powder', as we call it, still eludes me. Thanks for featuring A Mad Tea Party this week! Fantastic entry Kanchana. I have seen some people using black sesame seeds though not in my house :). Idli + podi is such a great combo, not to mention a great to-go meal! milagai podi looks so good. I made some yesterday. they are a must in the pantry. Lovely pics. Every south Indian has atleast a favorite spicy powder to go with dosas and idlis. We love chutney powder, almost a similar kind. The pics are to die for Kanchan!! Not really made this kinda dry podi often but it looks too tempting to resist! ..You have been Tagged for a meme by me! !..go through my tag post,when you have time :)!! Looking forward to ur meme..:).. I would suggest that when you grind it should be a tad less than fine, so you have a little bit of 'kaduk, muduk' feeling while eating! You are right,,,,it is a must at our homes.,....which sometimes is a good handy recipe for idly /dosai..Nice pictures. Heey,Love the anonymous with that beutiful TIP!! !is that your MOM!!!!??? And by the way, thanks for enjoying my blog. I have completed the meme by my sis. Do check it out when you have time. Loves the HRM pic too, u both look phenomenal. This is the authentic Tamil brahmin recipe...My ma-in law(what I make too)does exactly the same..:)...EXACT!!! My Mil adds a bit of coriander seeds to and this tastes slightly diff from what my mom makes.. My daughter loves dosa with milagai podi..Nice pics and good recipe. I dint know that milagai podi will be so interesting if pictures are posted! Thanks for visiting my blog. Dont worry about the deadline for the festive event. Your participation is all that matters for me. Nice. I added some peanuts to bring up the flavor a notch!! !